PLANTanswers: Plant Answers > Stop the Crape Murder! Plant Answers > Stop the Crape Murder! Crapemyrtles are among the toughest, most adaptable, and showiest plants that we can grow in our Texas landscapes. They have very few pests. They bloom all summer long. They require no supplemental irrigation. They have exfoliating bark that reveals spectacular smooth trunks. And they happen to have a branching structure that any floral designer would crave. They pretty much do every thing but mow the lawn for us. But for some reason, a mysterious reason that I havent quite solved, the majority of the "gardeners" (and ALL of the landscape crews) in Texas have made it a horrid ritual of butchering them. Then why do we do it? Actually I have several theories. But Im not going to share any of them with you for fear that you might some how feel justified in your arboreal disfigurement. I will tell you why not too, however. First of all it leaves horrible scars and wounds that last forever. Thats correct, FOREVER. I can show you exactly where any crapemyrtle on earth was topped. Its a "teenage tattoo" that can never be removed. It also makes a profusion of smaller branches resulting in a lack of proportion. All trees have a characteristic shape. It just so happens that crapemyrtles have one of the most beautiful. Topping does create larger blooms, though fewer of them. Unfortunately these larger blooms on new shoots have a tendency to flop over and droop after summer rains (remember when it used to rain in the summer?). And finally its down right ugly. We dont hack on dogwoods, redbuds, or Japanese maples. So why do we pick out the prettiest one of all to maim? Surely its not a "school girl" jealousy thing. How sick can we be to pick out the prettiest belle at the ball and scratch her face? This practice may look appropriate behind a chain link fence in a Mississippi trailer park, but I can assure you it is not appropriate for any landscape that you intend to be admired. Some of the most beautiful homes in Texas are now marred by embarrassing crapemyrtles. On the other hand, take a trip to Baton Rough, Mobile, or Charleston. They have an enduring admiration for their beautiful crapemyrtles and wouldnt think of undoing what nature has perfected. 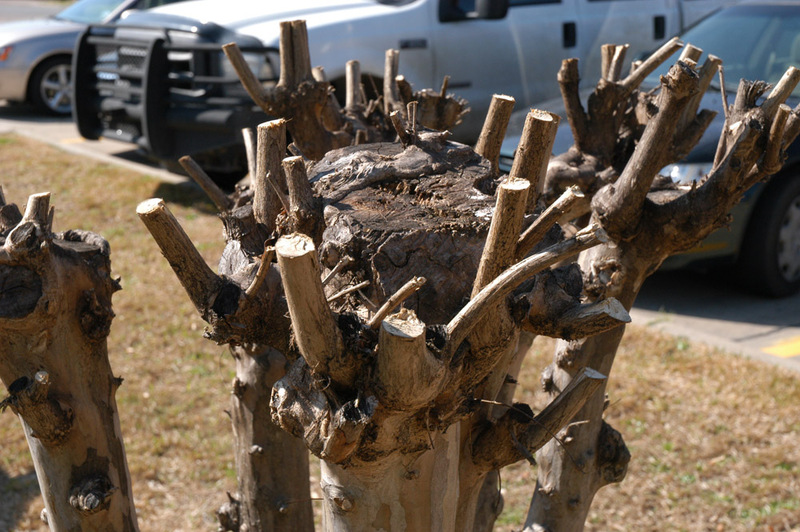 The only pruning crapemyrtles require is to thin out the trunks on young trees leaving somewhere around 3 to 7 permanents trunks. The fewer you have, the more you can admire their shape and smooth texture. Each year around early spring, all you do is remove any new suckers that appear from the ground or from you main trunks. Thats it. Yes, if the tree is small you can remove the seedpods, but realize that this is purely for aesthetic reason. Removing dried pods during the winter doesnt promote any more bloom during the summer. Removing them during the summer does promote faster re-bloom however. This nonsense of pruning back to pencil size wood comes from recommendations from the 1960s and is outdated. People apparently had a lot more free time on their hands then. Theres no telling how many thousands of dollars are wasted on incorrect pruning of crapemyrtles. 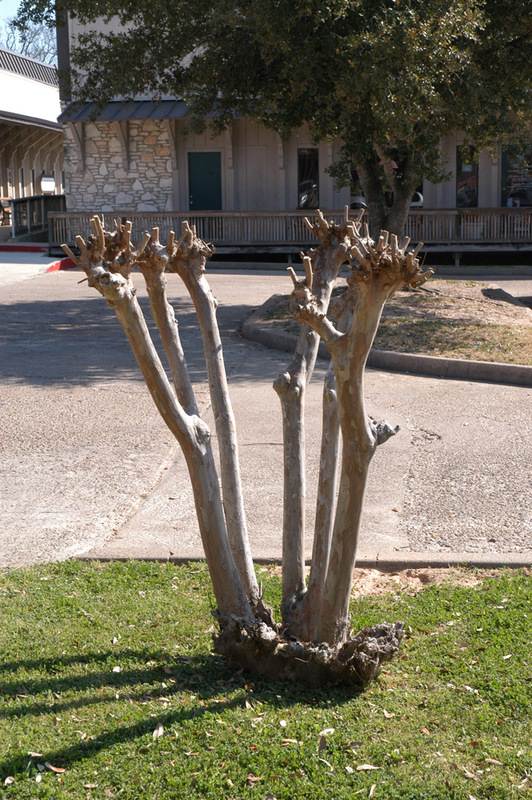 To be quite honest an unpruned crapemyrtle is almost always superior in appearance to a "professionally" pruned one. Some things in nature are hard to improve on. In my personal opinion, any landscape maintenance firm involved in this practice should be immediately fired! They are wasting your time and money and obviously dont care whats best for your plants or your landscape. If they took the time to educate themselves through seminars and reading, they would earn your money through more horticulturally sound practices. Im quite sure that the few of you left reading this soapbox diatribe cant wait to tell me what many have in the past. "But Greg, they got to big!" Much better to cut it to the ground and start over, or pull it out entirely, than to maim it. Most folks dont realize (but should) that there are many, many, cultivars of crapemyrtles that have an ultimate height range from 3 feet to 30 feet. For heavens sakes, dont plant a 30 foot crapemyrtle in a space designed for a 10 foot one. Check with a reputable nursery. If a tree type is too large, there are many smaller types available, including mildew resistant ones. There are a number of improved semi-dwarf cultivars in the 6-8 foot range including Acoma (white), Hopi (pink), Tonto (fuchsia), and Velmas Royal Delight (purple) that make outstanding small trees. Trees that NEVER need topping, that is. Thanks to Kings Nursery and Greenleaf Nursery, I have planted a collection of commercially available crapemyrtle cultivars in the commuter parking lot on University Drive on the SFA Univsersity Campus. This will be one of the only places in the state where gardeners can come see what each named cultivar is SUPPOSED to look like, a sort of "abuse free" zone if you will. They wont be sprayed, irrigated, or pruned. Theyll just stand there minding their own business, looking pretty in pink (and other colors as well, of course). There have been articles on this same subject in Southern Living, Neil Sperrys Gardens, and other southern magazines and newspapers. Unfortunately, the problem here seems to be getting exponentially worse each year. I can only assume that gardeners in Texas either dont read, or dont care. Please prove me wrong. STOP THE CRAPE MURDER! 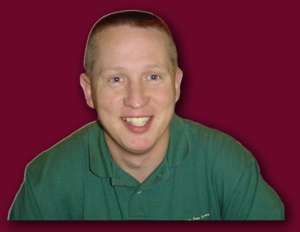 Greg Grant is a horticulturist for the Texas A&M AgriLife Extension Service, a contributing garden editor for Texas Gardener magazine, a founding and lifetime member of the Crapemyrtle Society of America, and a lifetime member of The Southern Garden History Society.